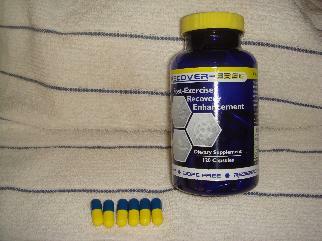 This product is designed and marketed to enhance your body’s ability to recover following exercise. 120 capsules per bottle (30 servings), with 2810 mg of Proprietary Blend (L-glutamine, L-leucine, L-valine, L-isoleucine, papain, bromelain, beta-sitosterol, citrus bioflavonoids). Other ingredients are: Gelatin, rice flour, natural vanilla, magnesium stearate, silicon dioxide. Includes 8 research proven ingredients designed to enhance your body’s ability to recover following exercise. Contains no stimulants, hormones or substances banned by USADA/WADA/USOC/IOC/NCAA or other sports governing body. Upon using this product as directed, at no point did I experience reduced muscle soreness or an increase in immunity. In fact, I caught a simple cold while using this product. One thing I found to be more effective than this product was good old fashioned sleep and a protein shake, with a massage thrown in. It seems this product (a sponsor of USAT), is one of the many that creates a multi-billion dollar supplement market in the USA each year, and claims were ineffective at best. In fact, I’ll classify this as one of the “also-ran” companies that prey on athletes looking for a quick fix pill to all their woes and pain. Look for this company to not last too long in the marketplace. Save your money buy a good can of protein or some German grade L-Glutamine, then get a good night rest.